Sunday afternoon was all about the boys (okay, and three of our girls!). 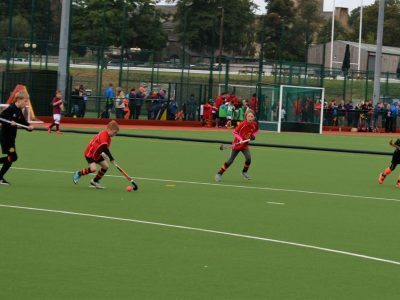 Matches at both Adel and Weetwood topped off our fantastic day of hockey with 26 U12s representing our club. At Adel they braved the drop in temperature. A couple of new faces complemented our more experienced crew even if lots of that experience was from the U10s. The Minis worked hard to keep structure even when the temptation was to follow the ball and get stuck in. They attacked as a whole team, but were unlucky not to score any goals. This effort was replicated in defence, as they also worked together to defend as a team. The results though didn’t always match the determination put in by our Bees with two draws and two narrow losses. The final game may have had a larger goal difference but playing without a keeper to get the game done before the rain added an extra challenge. We can’t forget our Bees team spirit of helping others with seven of our players helping out two clubs. Our Mini Bees seem to live by the mantra: the more hockey, the better! For the U12 boys at Weetwood, the blue skies were deceptive and it was freezing. Their first game was tough against Grimsby, who had already played so had settled in, and an unlucky goal saw them lose 1-0. The next match was against Slazengers, but by then our Minis had found their game and finished with a 4-0 win. 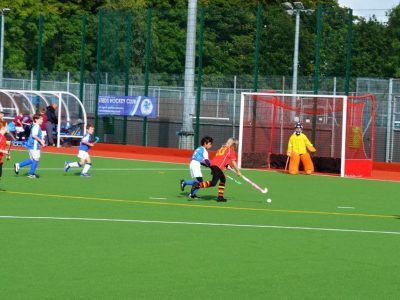 The third game was Thirsk and an unfortunate penalty corner resulted in a goal for the opposition. The penultimate game was against a strong Gateshead team but our team did us proud with some cracking saves from our goalie but an unlucky goal meant that Gateshead won 1-0. The final game against Doncaster was a 1-1 draw, a good result as the team were tiring and they had no subs due to injury. Thank you as always parents, for supporting your children and us coaches. On Sunday morning we saw our U12 girls in their first tournament in the Yorkshire youth league. The sun shone on our girls and, the smiles from them, their parents and especially the coach matched it. We had no idea what to expect from girls but we knew after years of playing against the boys they would give it a good go. They certainly did. Every single one of our them played their bees socks off. They worked hard, listened, were versatile by playing different positions and from this the results came. Their first match, though, was a bit of settling in period with a narrow loss of 2-1, from then on in, they fully shined: three games, three wins, one of them 3-0. The final game was a 0-0 draw but they were close to scoring. We’ll be sad to see a couple of the girls graduate from the U12s but if everything goes to plan they have a bright future in our U14s (unfortunately it will be back with the boys!). For the rest of our girls team, they will definitely be back for more next season. 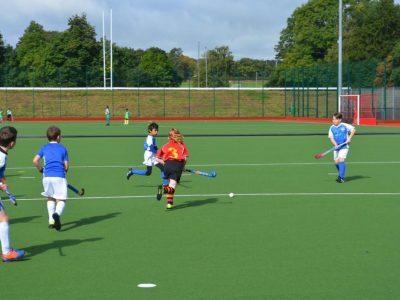 It was a fantastic morning of hockey for our U12s A and B team on Sunday. The A team played at Weetwood. Their first two games were very evenly matched, but sadly, in both the opposition managed to just get one past them. The team managed to keep their heads though, and came back in the third game with a 2-0 win; with great team goals made possible by fabulous passing and working round the keeper in the D. The fourth game saw another victory with a 2-1 win. The final game of the day brought them a 1-1 draw. For the boys U12s B team it was a step up to the next division and the first time out as team, with a number of the boys making their debut from the U10s. They were supported by the more experienced U12 girls, so it was always going to be an exciting morning. From the start the team gave it their all, defending and attacking as a team. Each game they improved and worked hard on marking and keeping their positions on the pitch. Strong defending meant balls were coming through to the midfield and attack with some great attempts on goal. The results didn’t match the flow of the games with three loses and a win. 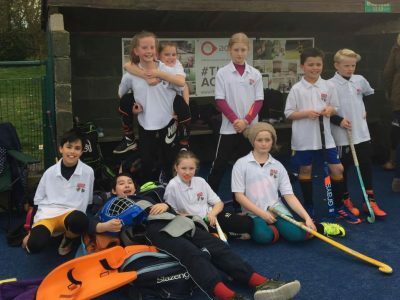 The disappointment from our Mini Bees in the last game, with a narrow loss, shows just how much hockey means to them and we hope they take away the knowledge that their coach and parents are incredibly proud of them. Sunday was a great day to be a Bingley Bee. Firstly there was some fantastic teamwork going on from everyone who was representing Bingley Bees. That though, wasn’t just the players on the pitch but also the volunteers who stepped in and umpired, goalkeeper coached and helped run the U10s. 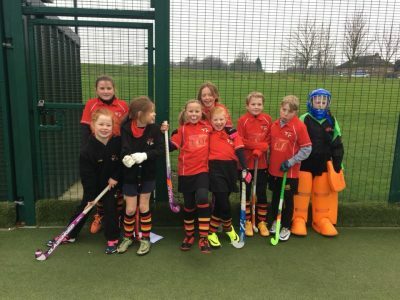 It also included those parents and grandparents who teamed up, shared lifts and were so supportive of our players in such a positive way; as one of our Mini Bees said: “Awesome Teamwork”. 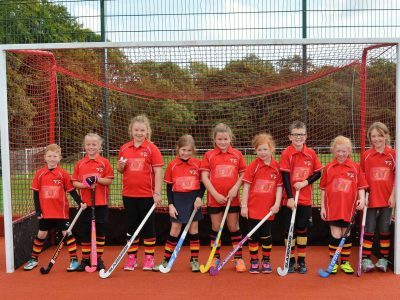 It was the second time out for our U10s with a slightly different team from last month. From the start, the team put into practice what they had learnt in training and actually, a few skills they hadn’t, with an amazing pass around the back which our senior teams would have been proud of. The defenders did exactly what was asked of them, pushing up into the attack when they could, resulting in them sometimes being in their attacking D. Everyone worked hard on keeping to their positions on the pitch which meant players were in the right spaces to receive the pass, and, when they weren’t, it confused the opposition as well as the coaches! This along with some individual brilliance resulted in some great score sheets – 1-1 draw, 2-0 win, 2-1 win, 4-0 loss and a 1-0 win. 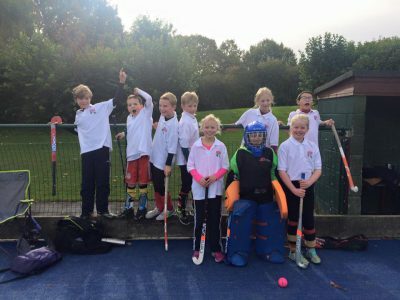 Once again our Mini Bees showed good hockey spirit by playing for Wakefield Hockey Club who were short of players. At the other end of the age groups we had our U16 girls. 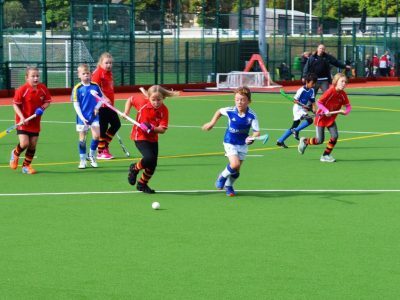 This year we have linked with Airedale Hockey Club to enable our older girls the chance to play competitive hockey. All four of our girls were an asset to the team especially as for three of them it was the first time they had played a full pitch 11-a-side game. Four draws and one loss made for a great morning out. The future of our club is safe with this brilliant lot! We were so proud of every single one our U10s on Sunday. Only three out of the 10 Mini Bees had played tournament hockey for the club before but, you wouldn’t know it. They worked really well on keeping their positions on the pitch, passing the ball and, that all important tackling they have been working on. This resulted in a fantastic three wins, one draw and a narrow loss. The whole team effort was reflected in the Man of the Match results with every player getting a vote. Also in true Bees’ style, we loaned players to two other clubs ensuring that all our U10s had a great experience. A big thank you to the parents for their support especially as it was a bit chilly, and once again for the supply of the team biscuits. A great morning for hockey. 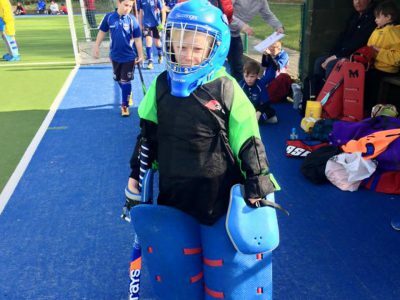 At Bingley Bees we always like to mix it up a bit and this week our boys’ B team were all girls. We couldn’t have asked for more effort in spirit and running from the team, especially as we loaned some players and an umpire to another club in the exchange for a keeper! 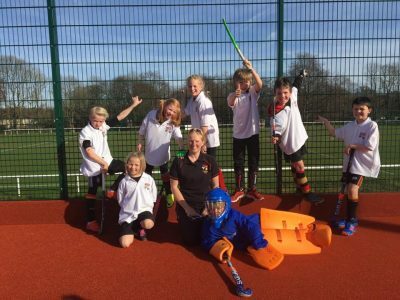 Whilst they didn’t win any games they have learnt a lot, especially as for some this was only their first/second time of playing competitive hockey. We can coach skills at training but they only really learn the game from playing. All the girls showed some lovely skill. Things for the U12s’ B team to take away from today is to be confident of their own ability, go to the ball for the tackle and enjoy the game. Our U12s’ A team played at Weetwood and rocked it. They played five games, winning three and drawing two, scoring 11 goals in all with only two goals against. Well done everyone your coach and parents are proud. Also a big thank you to those who helped out today.